Since 2012, Kindergarten to Grade 12 classes from across Canada have participated in the Shell Canadian Geographic Classroom Energy Diet Challenge. By completing the curriculum-linked challenges that make up the Classroom Energy Diet Challenge, kids have explored all-things energy! What is it? How do we use it? And what can we do to ensure that Canada and the world have a sustainable future? This year we have brought back our popular Citizen Challenges. We’ve taken two of our challenges from the Classroom Energy Diet Challenge — Get Growing and Take Home — and adapted them for use outside the classroom. Starting Monday, April 8th, we will launch the first challenge “Get Growing” here on the blog and on social media. You will have until Friday, April 12th, to submit your entry over social media or by email at info@energydiet.ca. 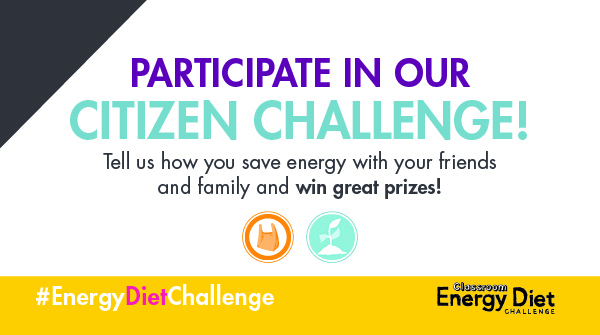 We will draw three valid entries for each Citizen Challenge. Winners who will be awarded a $100.00 Shell gift card which can be used for many items, including those sold at Shell convenience stores. To participate in the Citizen Challenge, you must be 18 and over.